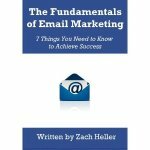 I'm happy to announce that my new book, The Fundamentals of Email Marketing: 7 Things You Need to Know to Achieve Success, is now available on Amazon.com. You can purchase a copy here for $5.99. The book is meant to serve as a guide to email marketing for marketers and small business owners who are either new to email marketing altogether, or have an existing campaign and would like to know how to improve it. I welcome all feedback. I hope you enjoy it!